* Legacy Product: Replaced the highly succesful C6713Compact, with extended availability for our long-term commercial customers, but not recommended for new designs. Please visit our home page for the latest active products. The micro-line C6713Compact-2 replaces the highly successful C6713Compact, providing the same capabiltiies, but with a more current and capable Spartan-6 FPGA. The C6713Compact-2 offers a flexible DSP/FPGA single board solution for developers requiring integrated DSP, FPGA, and FireWire resources. It can be used as a stand-alone system, or as a mezzanine daughtercard embedded within a larger system or board design. The design incorporates a high performance TMS320C6713 floating-point DSP Processor, a Spartan-6 FPGA, IEEE 1394 FireWire communications interface, up to 64MBytes of SDRAM, and 8MBytes of FLASH ROM. In situations where additional functionality is required, developers can extend the capabilities of the C6713Compact-2 with their own application-specific hardware. 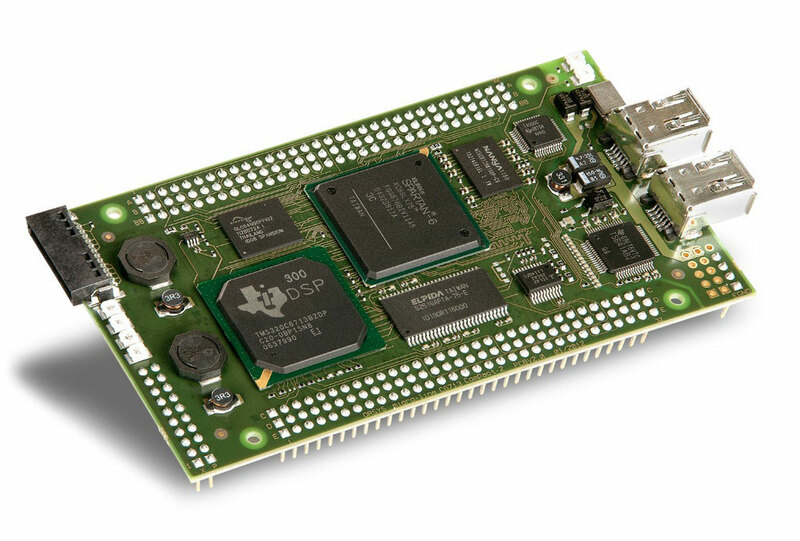 External hardware is easily interfaced with the TMS320C6713 processor or connected directly to the Spartan-6 FPGA. The micro-line power supply functions as a base for a micro-line stack of DSP, data acquisition and I/O boards. It delivers power to the micro-line stack and provides additional services such as RS-232 communications connector, a reset button and a power-on indicator. OEM developers may wish to mount the micro-line stack on their own hardware. A rich suite of peripheral & I/O options are provided for interfacing with micro-line DSP boards. These include serial and parallel digital I/O, 400MBit/sec IEEE 1394 FireWire communications, and direct access to the micro-line bus for memory mapped peripheral hardware design and integration. The on-board FireWire interface facilitates C6713Compact-2 integration with other embedded DSP resources, cameras, sensors, and host computers. FireWire provides guaranteed bandwidth for mission critical applications, live connect/disconnect, and many other impressing features.